The music of Rolf Gehlhaar is not “pretty” – it’s pretty wild. Solipse for amplified solo cello and tape delay from 1973, one of Gehlhaar’s earliest compositions, must quite simply be one of the most inventive pieces for solo cello from the second half of the 20th century, in the top drawer with Xenakis’ Kottos or Crumb’s Sonata (among those that spring immediately to mind). Like Xenakis, Gehlhaar doesn’t so much aim at melody as at sheer sounds. Nonetheless, there develops starting at 8:30 a long, quasi-drone passage, first in the softest caressing dynamics with the strings seemingly brushed by the bow, that borders on folk or repetitive music, of great beauty. The orchestral range of sounds and colors he elicits from a solo cello and the mirroring or echoing effects borne by the tape delay (the cello is pre-recorded) is simply stupendous. Cellist Julia Ryder is phenomenal. Polymorph for bass clarinet and tape delay (1978) and Rondell for solo trombone with tape delay (1975) are architectured in a semi-aleatoric way following elaborate and disciplined principles of variation where the dominating influence of Stockhausen can be perceived, and, as with Solipse, the result is tonally fascinatingly lush and imaginative. 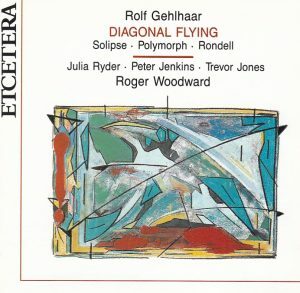 Diagonal Flying for piano and synthesizer is a later composition (1989) and also, at 30-minutes, the longest composition on disc. It applies the “Sound-Space” software to the gestures and movements of the performer, with electronic sounds entirely controlled by the pianist’s hand positions and movements and fed back. Again it develops a fascinating sound-world, where the piano rises to heights of frenzied pounding that I thought only Nancarrow’s mechanical piano could produce – kudos to Roger Woodward – interacting with eerie – and often humorous – electronic sounds, making the composition something like a duo for piano and electronic percussion. 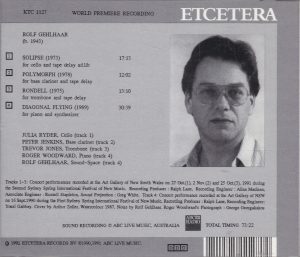 Based on this recording, I don’t understand why Gehlhaar is so badly represented on disc. Gehlhaar has a website and you can consult the catalog of his works and discography (the latter is not entirely easy to find: it’s counter-intuitive, but you need to click on the tab “Words”). His new works grind to a near stop after 1998, with nothing since 2006. His discography is also very short – this here is his only complete disc, the rest are tracks on compilation CDs. Solipse is apparently his most popular composition, with two other recordings. Available on the website is also a long presentation of Solipse (clicking on the link will open a Word document), the circumstances of its inception and its underlying concepts. Gehlhaar is currently Professor of Design and Visual Arts at the Coventry School of Art and Design in the UK, his “subject expertise” being sound/music, design, sensor electronics, interactive multi-media.